Off the Beaten Path: 100th Post Give-Away!!!! Today I'm celebrating and I invite you to celebrate with me! This is my 100th post on Off the Beaten Path, and I'm tooting my own horn by giving away two great prizes to two lucky commentors. One of them could be you! I know for some folks it is traditional to post 100 facts about themselves on their blog for their 100th post, but I just couldn't bring myself to do that. I feel like this blog is too self-serving as it is. I get this wonderful outlet for writing and talking up a stream and venting and tossing questions into the universe and occasionally posting a photo of my kids or even rarely posting one of myself when I happen upon a trifecta of good hair, a somewhat normal facial expression, and a blessedly disguised waistline. You, on the other hand, just have to put up with it all. Amazingly, many of you do so willingly. 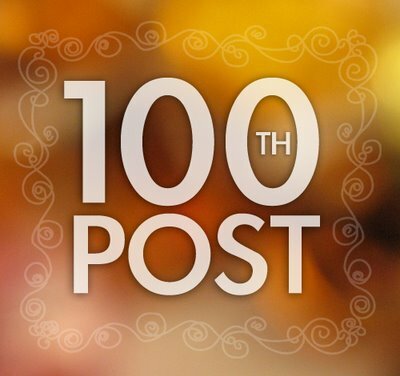 So today, in this 100th post, instead of celebrating my 100 ramblings, my 100 attempts to write something pithy or witty or inspiring, or my 100th picture, I'm celebrating my more than 100 friends who read what I write. Thank you, thank you, thank you. For reading, for commenting, for laughing, for crying, for stopping by, for coming back every day. Thank you. And now.... for the good stuff! The bag is insulated for cold or warm food carriage and large enough to carry food for two. Thus, I've named it the Chic-nic because I thought it would make a great bag for a chick to pack a picnic lunch for her and a friend! pretty spring paper plates and napkins - enough for several chick-nics! and the May & June editions of Tapestry (or Journey) devotional guide, for which I write devotionals. I'll even dog-ear the devos I wrote for you - what a treat! And that is the total Chick-nic prize! one of my favorite things - a 4x6 photo album with index cards so you can memorize scriptures! I made this one especially for you! and here's the clincher - a cute new spring coffee (or tea) mug with a $10 gift card to Starbucks! Am I feeling generous and happy or what? I did the happy dance all over Target tonight as I put the final touches on these gifts and I'm thrilled to give them to two of my lucky readers. I wish I could give them to all of you...maybe one of these days. You get your name entered once for just leaving me a comment. But here's what I want on the comment. I want to know five things about you! If I get at least 20 comments, that will give me 100 facts about you - my readers. That's so much more interesting than 100 facts about me. So leave a comment with 5 facts about you. If for some reason you have a hard time leaving me a comment, you can also send me a message through my "contact" link at the top navigation bar on this blog. And if you leave your comment as "anonymous" you'll need to give me your name in the comment itself. You get a second entry if you mention this give-away on your blog or on Facebook. Just include a link to this post on your blog or Facebook and tell me about it in a second comment. I'm assuming that those of you who aspire to do this second entry know how to do so. You just right click on my post title, select "copy link location" and then copy this link into your blog post or FB post. You don't have to write a whole post about this contest, just mention it! You get another entry if you become a trail buddy (follower) and you aren't already one. Just let me know in another comment. You get another entry every time you post a comment on my remaining posts this week! Woo hoo! I'll be posting Wednesday through Friday, so that's three more opportunities for you to enter. Ok, that's it. And the contest goes through Monday, April 12th. So if you're checking in here anytime before then, get your comments in and cross your fingers!